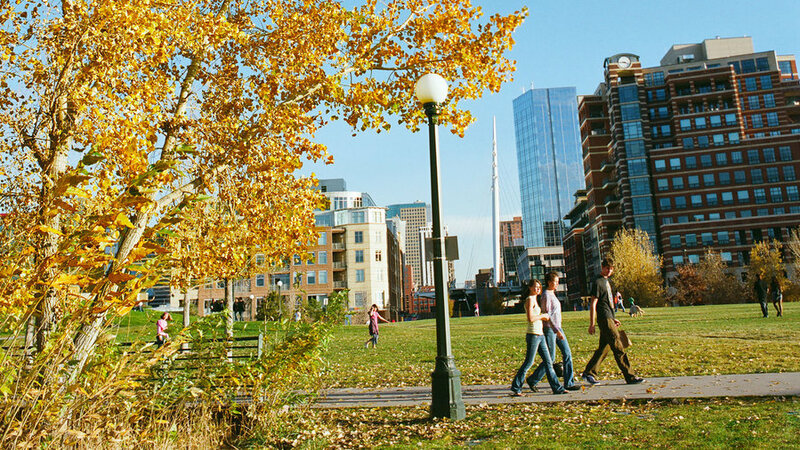 Sit under an elm tree in Commons Park to take in Denver's fall color. Why go in fall: Head to our favorite hilltop and you won’t need to leave the city for a hit of fall color. The look: Lofts, flats, and new restaurants vie for space with ornate 19th-century brick buildings. Claim to fame: The rooftop bars and alfresco restaurants draw crowds for the downtown skyline views. We like a prickly-pear margarita on the patio at LoLa Coastal Mexican ($$; 1575 Boulder St.; 720/570-8686). Who used to be here: After the 1864 Cherry Creek flood, a wave of residents and new immigrants moved to higher ground. Who’s here now: Young urbanites and the post-work happy-hour crowd. Get some joe to go: Rev up at Shangri-La Coffee ($; 1575 Boulder St.; 720/855-7585). Worth a cruise-by: Check out West 28th Avenue, aka Stoneman’s Row, for its 19th-century homes. Need to refuel? Try the tuna sandwich stacked with avocado, aioli, capers, and pine nuts at the Squeaky Bean ($$; 3301 Tejon St.; 303/284-0053). Rent a bike in LoHi and pedal over the Highlands Bridge for some window shopping in downtown Denver. Plunk down a token fee to unlock a red bike from one of Denver B-Cycle’s three LoHi locations (16th St. at Boulder St., Little Raven St., and Platte St.) and pedal across Highlands Bridge. Swing by Salvagetti Bicycle Workshop (1611 Platte St.; salvagetti.com or 303/691-5595) to check out the cool custom bikes for sale. On sunny days, Little Man Ice Cream becomes LoHi’s de facto town square, serving handmade ice cream, sorbet, and gelato beneath the shop’s distinctive giant milk-jug edifice. Try the silky Pumpkin Chip ice cream in the straw-baled pumpkin-patch patio. 2620 16th St. or 303/455-3811. Afternoons, the LoHi SteakBar rolls up its retractable doors and springs to life. Bartenders pour a slew of Colorado microbrews, plus drinks like Hot Apple Pie Cider and strawberry mojitos. Hungry? Try the El Tejon burger, with egg, cheddar, and chili on a garlic bun. $$; 3200 Tejon St.; 303/927-6334. Need a bamboo-fiber bathrobe? Neither do we, but find one and tons more eco-friendly items at Dragonfly Ecogoods in Denver. Eco warriors: Look inside the quaint, cottagelike Dragonfly Ecogoods for sustainable finds like reuseable lunch bags, recycled-glass jewelry, and bamboo-fiber bathrobes. 2001 W. 32nd Ave.; 720/542-9795. Gearheads: Like a toy store for adventure seekers, Wilderness Exchange Unlimited has some of the best prices in town on a mind-boggling array of new and used rugged clothing, backpacks, sleeping bags, hiking gear, and gizmos. 2401 15th St. or 866/964-0708. Pet lovers: For furnishings that stand up to a little abuse, especially of the furry variety, find inspiration at the Livable Home. Slobber-proof furniture, lighting, and pet beds are durable and stylish. Closed Sun; 2510 15th St.; 866/572-9963.